there is a local health-food store where we live that sells all sorts of healthy snacks. one of our favorite snacks from the health-food store would have to be their garlic sesame sticks. we buy them buy the bag full whenever we are there, and we love taking them to work with us for a little snack after lunch. 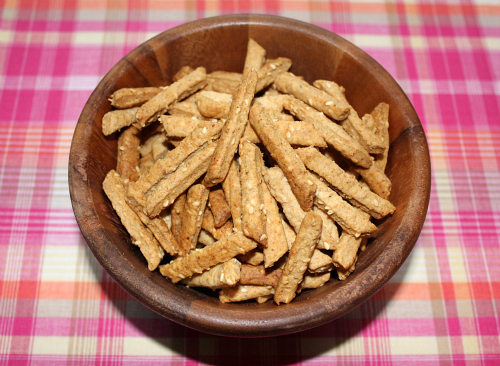 we recently tried making our own version of the garlic sesame sticks at home. as it turns out, we like our version even better than the health-food store's version. these garlic sesame sticks have just the right amount of crispness to them, and they are the perfect snack to satisfy that mid-afternoon hunger craving at work. in a saucepan, over low heat, melt the butter. once melted, set aside. in a food processor, grind the oats until powdered. add the flour, garlic powder, sugar, and baking powder and pulse to combine. add the melted butter and pulse until the mixture forms a wet bread-crumb like consistency. with the food processor running, gradually add the water until the dough forms into a ball. remove the dough from the food processor and place it on a lightly floured surface. knead the sesame seeds into the dough. set the dough aside to rest for 30 minutes. preheat your oven to 325 degrees F. place the dough between two large sheets of wax paper. using a rolling pin, roll the dough until very thin. use a knife or a pizza cutter to cut the dough into small strips. place the strips on a cookie sheet lined with parchment paper. bake for 15-20 minutes, or until the sesame sticks are light brown and crisp. remove from the oven and allow the sticks to cool completely. store in an air-tight container. I was just going to ask for this recipe. We are starting to run low on the sesame sticks from the health food store. I like yours much better because they are not as salty and you can adjust the seasoning. And of course you know what goes into them.